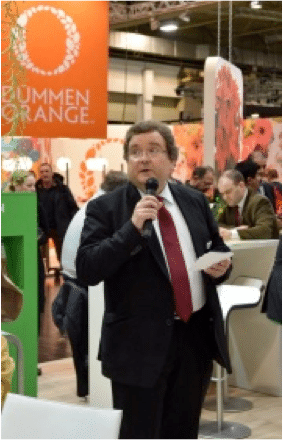 Klasmann-Deilmann can look back on suc­cess­ful par­ti­ci­pa­ti­on at the Inter­na­tio­nal Plant Fair (IPM) in Essen. The com­pa­ny used the event to streng­t­hen its clo­se con­tac­ts with the hor­ti­cul­tu­ral sec­tor world­wi­de and to sha­re expe­ri­ence with an inte­rested spe­cia­list audi­ence from all over the world. Its inno­va­ti­ve and sustainab­le solu­ti­ons in the world of gro­wing media met with a posi­ti­ve respon­se. Lively dis­cus­sions were also promp­ted by the new fer­ti­li­ser for­mu­la­ti­on used in orga­nic substrates that dra­ma­ti­cal­ly redu­ces pres­su­re from sciarids, and the rede­fi­ned ran­ge of substrates for soft fruits. Klasmann-Deilmann’s exhi­bit had ple­nty of visi­tors – around mid­day, it was often stan­ding room only (if that!). “Year in, year out, it’s gre­at to see how many peop­le we can play host to,” says Horst Kup­schus. “The infor­mal, even cosy atmo­s­phe­re bet­ween us and our part­ners is tan­gi­ble.” An addi­tio­nal high­light during the IPM was a stand par­ty that attrac­ted even lar­ger num­bers than in the year befo­re. Taking stock after this year’s IPM, its orga­nisers announ­ced: “More visi­tors, more decisi­on-makers, more busi­ness deals,” repor­ting a total of 1,588 exhi­bi­tors from 49 coun­tries.